Sun., May 21, 2017, 8:15 p.m.
San Antonio’s sense of humor was still there Sunday. 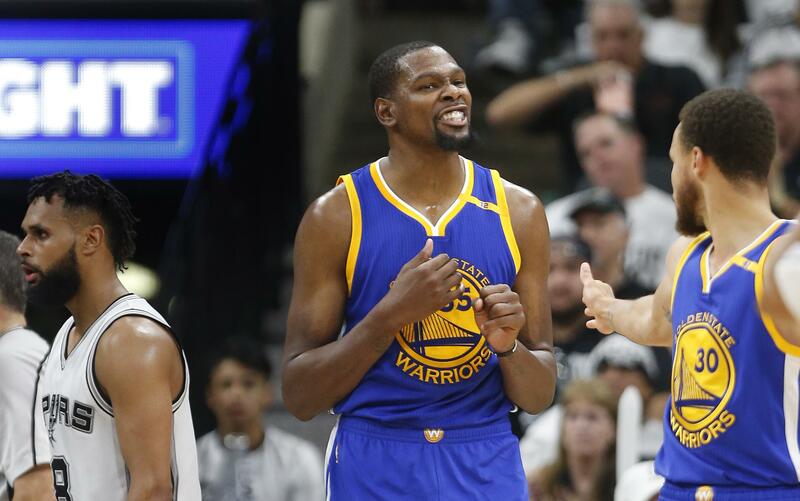 Gregg Popovich predicted that Golden State stayed out way late after winning Game 3 of the Western Conference finals, celebrating with burgers and sundaes before spending Sunday playing poker. Manu Ginobili, amid plenty of questions about whether his career is ending, said the Spurs planned to lose the first three games of this series simply to make their comeback look more impressive. The reality is that Golden State is just better, especially against a seriously undermanned Spurs team. All jokes aside, the Spurs – and everyone else watching this West final – know it’s just about over. No team has successfully rallied from 3-0 down in an NBA playoff series, and a San Antonio team that is without Kawhi Leonard, Tony Parker and now David Lee is facing that most precarious deficit. Game 4 is Monday in San Antonio, with Golden State now on the brink of clinching its third straight NBA Finals trip. He’s right, of course. How different this could have been if Leonard didn’t re-injure his ankle when San Antonio was rolling with a 23-point lead in the third quarter of Game 1. The Spurs led by at least 22 points in each of their first four games against the Warriors this season. What they did against Golden State worked better than what anyone else did against Golden State. Leonard – who won’t play in Game 4 barring something “miraculous,” Popovich said – has been out since landing on Zaza Pachulia’s foot in a hotly debated was-it-dirty-or-not closeout by the Warriors’ center. Game 1 changed in that instant, the whole series changed along with it and the Warriors will become the first team in NBA history to start a postseason 12-0 if they win on Monday. The Warriors have made it look easy, which is their normal. Golden State has won 12 consecutive games, the third time this season the Warriors have enjoyed such a streak. Combine the regular season and the postseason, and this Golden State team (78-15, .839) has a better record so far than last year’s regular-season record-setting club (88-18, .830). “We’ve got to play better,” Warriors guard Stephen Curry said. As impressive as they have been, the Warriors have had lapses. Golden State turned the ball over 21 times in Game 3 , leading to 25 San Antonio points. The Warriors also yielded 15 offensive rebounds, which San Antonio turned into 18 more points. They won by 12 anyway. And if closing a team out on the road is supposed to be among the toughest postseason tasks, the Warriors have apparently missed that memo: Golden State won by 26 in Portland to clinch the first round, and by 25 in Utah to close out the second round. “You let those guys get rolling, they’re a handful,” Spurs forward Pau Gasol said. Ginobili helped keep San Antonio close in Game 3 with 21 points. He’ll likely get an emotional welcome Monday, just in case the veteran decides this season will be his last – a topic he wanted really no part of on Sunday, saying he’ll decide over the summer. Published: May 21, 2017, 8:15 p.m.